Operating at speeds of up to 25 pages per minute (LTR), the imageRUNNER 1025iF offers high-end capabilities for small businesses and workgroups. The imageRUNNER 1025iF model provides full-color document distribution capabilities that incorporates Canon's proprietary PDF High Compression technology for efficient handling of color documents and image data on your network. Plus, the imageRUNNER 1025iF also offers powerful Super-G3 Fax technology to send and receive documents with speed and ease. The imageRUNNER 1025iF also supports advanced digital copying, automatic duplexing, full color scanning,network printing capabilities, as well as a standard 50-sheet Duplexing Automatic Document Feeder. Offering innovative information-sharing tools at the touch a button, the imageRUNNER 1025iF device changes the way your small business or workgroup communicates. 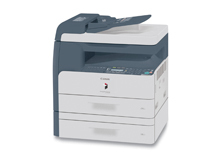 Operating at up to 25 pages-per-minute (LTR), the imageRUNNER 1025iF is equipped with 256 MB RAM. Exceptional memory capacity provides users with high-speed image processing of data and simultaneous processing of each function. With a scanning resolution of 600 x 600 dpi, and print/copy resolution of enhanced 1200 x 600 dpi, the imageRUNNER 1025iF delivers outstanding, exceptional image quality for the most faithful reproduction of text and images. Color-enabled document distribution allows users to communicate information more effectively; Includes support for PDF High Compression technology for efficient handling of color image data. With a maximum paper capacity of 1,100 sheets, the imageRUNNER 1025iF device has been designed to meet the volume requirements of any small business or busy workgroup.